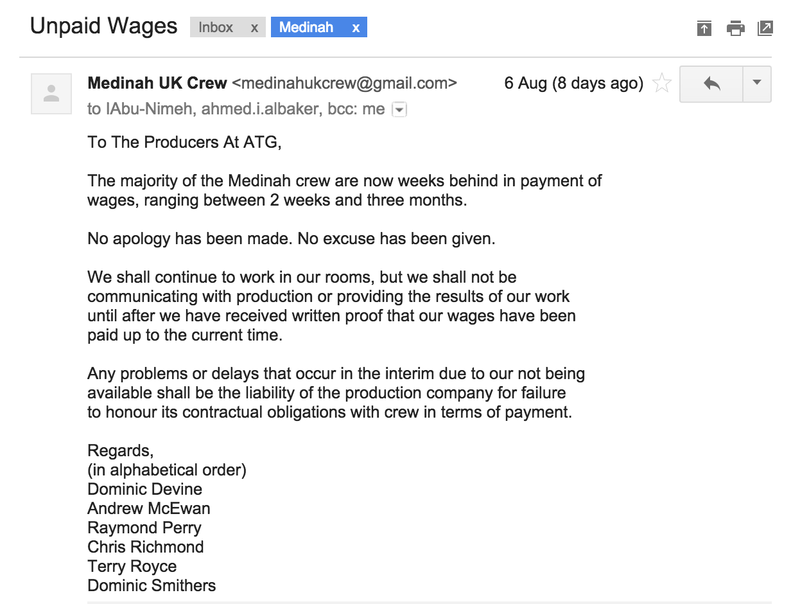 This entry was posted in ATG Bullying & Threats, Shifting The Blame, Unpaid Wages Battle (Early 2016), Unpaid Wages Battles (2015), Us & Them and tagged abdul, ahmed al baker, atg, atp, cash flow, chris richmond, doha, embezzling, fadi al shwaihat, issam, line producer, majid, medinah, ray perry, simon hunter, terry. Bookmark the permalink. And what gets me is even after this has all come out in the wash, ATP we’re still given vast amounts of money to pilfer, squander, embezzle, basically do everything with the money but what they were supposed to do. Pay the crew!!!! I can’t believe that the investors still allowed ATP to pull the wool over their eyes. Even though being still owed an amount of money, I am glad I got out. Got away from these scheming, lying theives.